Cold Weather Tips To Keep Your Pets In Good Health : Shots - Health News Keep the dog away when you're shoveling snow. Some can't resist jumping toward the flying flakes, and a dog is no match for a shovel blade. The sweet taste of antifreeze can be enticing for pets, but ethylene glycol, the main antifreeze, is also quite toxic. Clean up spills and drips. 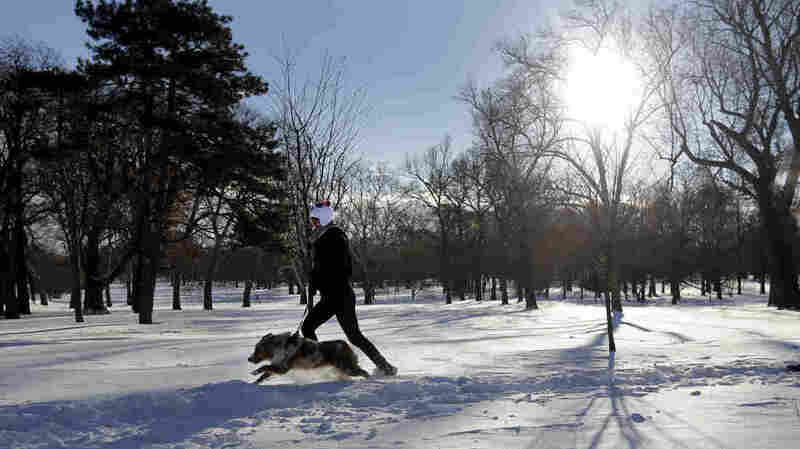 Courtney Martin jogs through the snow with her dog, Theodore, in St. Louis. Missourians and their pets muddled through another frigid day Tuesday. Here I sit shivering, wishing I were a dog or cat to get through this cold snap. A built-in fur coat, no commute and maybe some quality time by the fireplace. What could go wrong? Quite a few things, it turns out. The friendly animal lovers at the University of Pennsylvania School of Veterinary Medicine's Ryan Hospital report seeing a few wintery problems for pets in the ER over the last few days. Some you might not have expected. "One thing that we saw this weekend was rabbits who were in a basement during the cold weather," Dr. Deborah C. Mandell tells Shots. The rabbits were sick with a life-threatening condition called gastrointestinal stasis. Their intestines stopped working. Exposure to cold can trigger the problem, says Mandell, an emergency and critical care vet. The rabbits did fine after they were gently warmed. The rabbits reminded her of a puppy the hospital treated last winter. He was comatose after falling into a swimming pool containing some cold, but unfrozen, water. After about a half-hour in the pool, his body temperature had fallen to 63 degrees, Mandell recalls. He did well after some "aggressive warming," she says. Getting wet while being exposed to cold can make Fido and you more likely to develop hypothermia. So keep yourselves dry. Mandell and the other vets at the University of Pennsylvania had some other tips for keeping your pets in good health when the weather is bitterly cold. Wipe your dog's paws off after a walk. Get the salt and frozen snow out from between their pads and toes, Mandell says. Washing them off when the salt is heavy can minimize irritation. Put a sweater or coat on small dogs or those with short coats. They need help staying warm. Keep the dog away when you're shoveling snow. Some, like my colleague's half-blind Oly, can't resist jumping toward the flying flakes. A dog is no match for a shovel blade. If you live in a neighborhood like mine, where the cars and many of the cats are kept outdoors, knock on the hood of your car before you start it. Cold cats like to huddle next to warm engines. Better you should wake one up than the fan belt. Finally, there's another car-related hazard with a link to cold weather: antifreeze. Leaks or drips from the radiator can be enticing for pets. Ethylene glycol, the main antifreeze ingredient, is sweet, but it's also quite toxic. Clean the stuff up to avoid trouble.